Here we are: the P5000 vs GTX 1080 battle. For the GTX 1080, I used the ASUS Strix GTX 1080. This card has a boost clock speed of 1936MHz and a memory clock speed of 5005MHz. 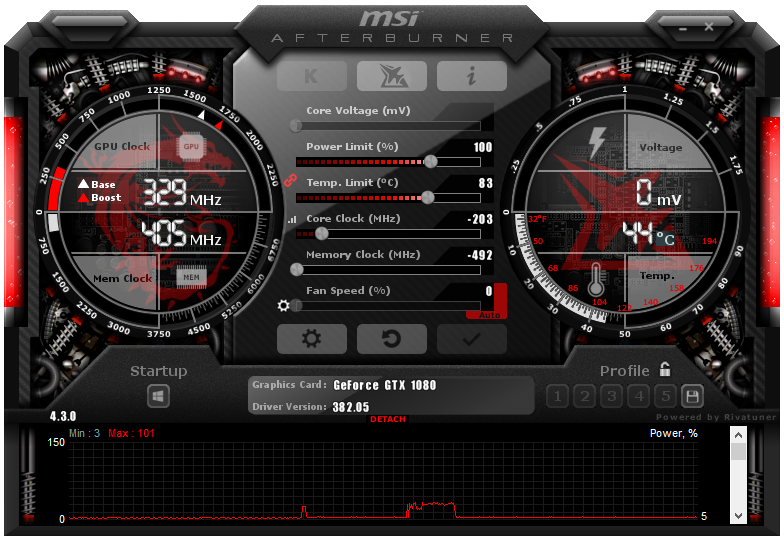 In order to compare apples with apples, I downclocked the GTX 1080 with MSI Afterburner: -203MHz for the GPU core and -492MHz for the memory. 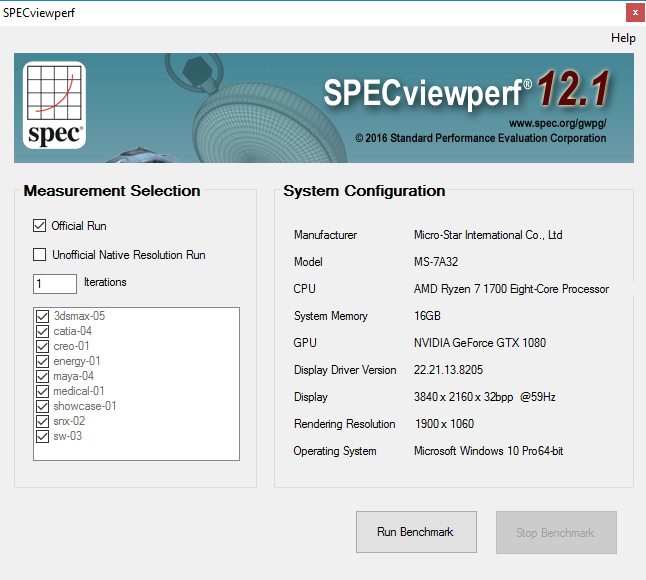 More information about SPECviewperf can be found HERE. 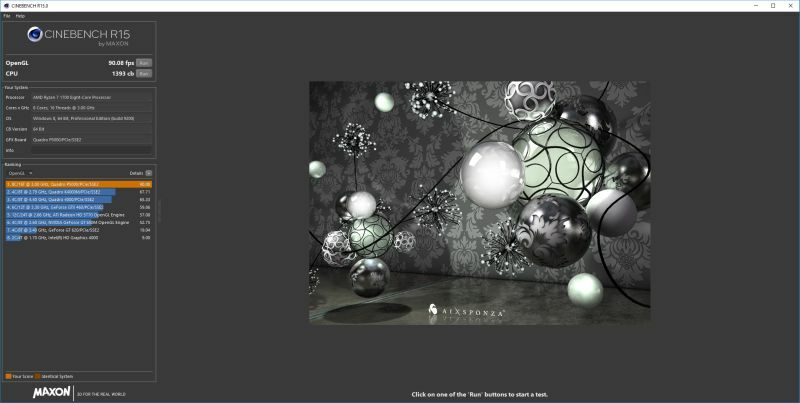 LuxMark is an OpenCL benchmark. There are 3 tests: light (LuxBall HDR), medium (Neumann TLM) and heavy (Hotel lobby). Like with LuxMark, there is no significant difference between the P5000 and the GTX 1080. FurMark 1.19 can be download from THIS PAGE. There is no important difference between the P5000 and the GTX 1080, but the GTX 1080 is faster. 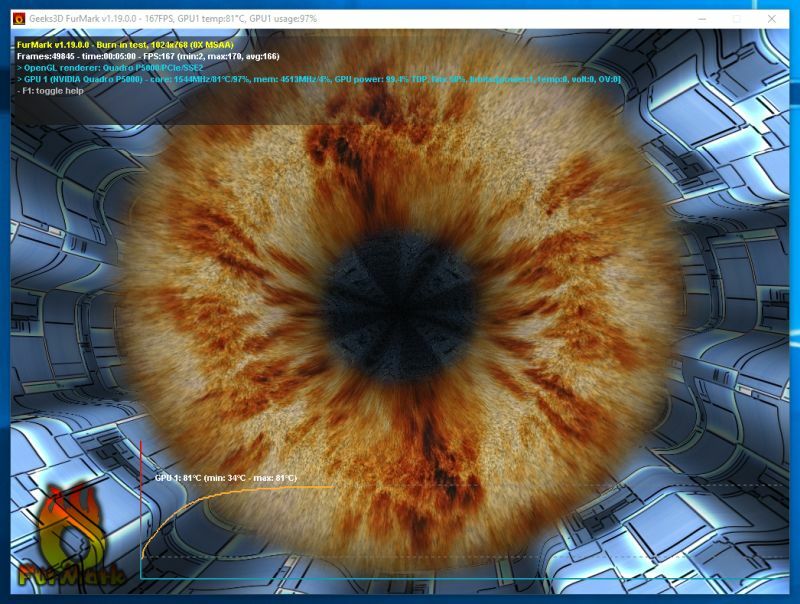 Superposition is the new graphics benchmark from the Unigine team. I covered it in THIS ARTICLE. The scores are similar to FurMark ones: no important difference but the GTX 1080 is faster. This test is a pure pixel shader test with GeeXLab. 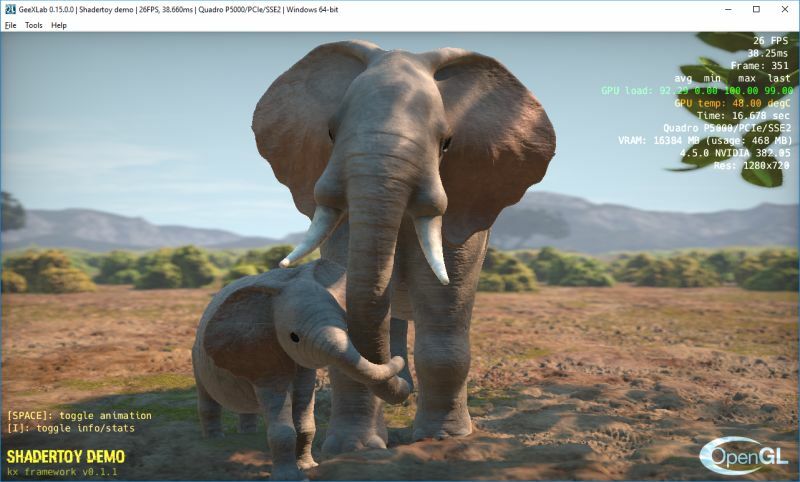 I selected the Shadertoy Elephant demo with is very heavy. This pixel shader demo can be found in GeeXLab code sample pack in the gl-21/shadertoy-multipass/gl21-elephant/ folder. Many CAD softwares render meshes with illumination performed on both sides of a polygon. Each side can have different material properties (ambient, diffuse or specular). I updated GeeXLab with the support of two sided lighting and I coded a simple demo that renders four times a cylinder (641’601 vertices and 1’280’000 faces) for a total of 2’566’404 vertices and 5’120’000 faces. There is one light (GL_LIGHT0) and of course there is no shader. 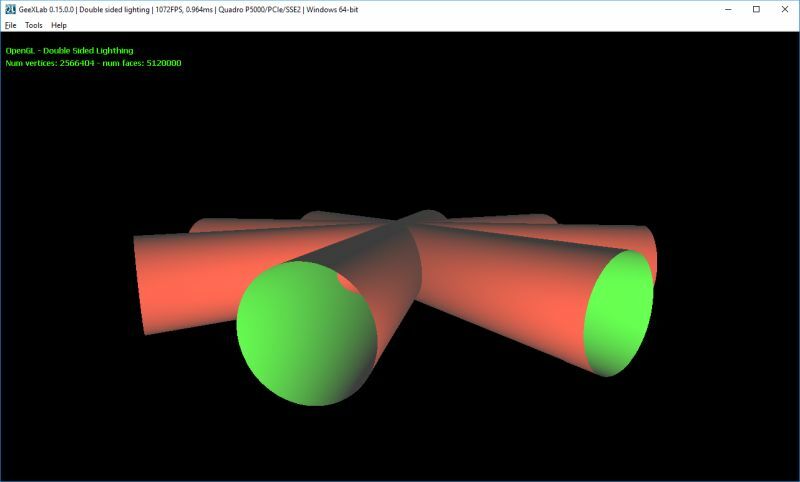 Only old OpenGL fixed pipeline is used to render the scene. 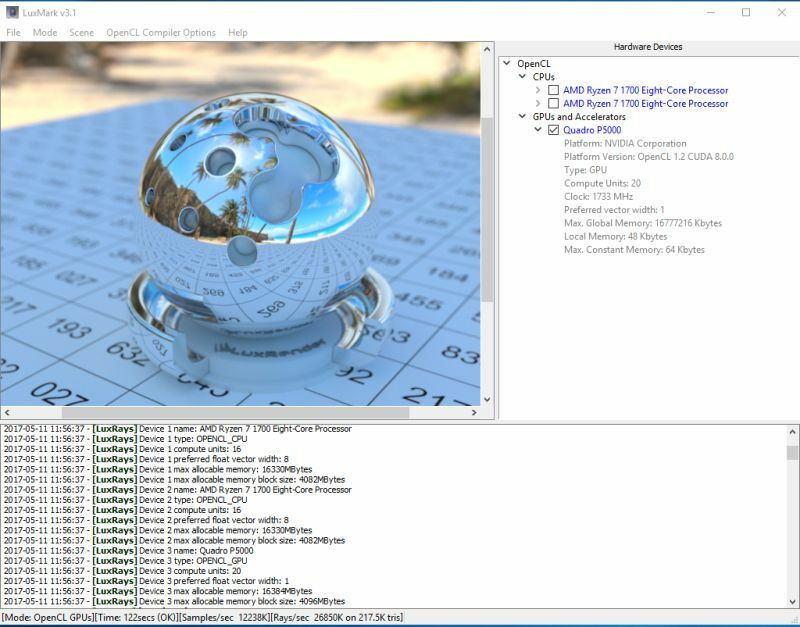 If you want to play with this demo, you need the latest GeeXLab 0.15.0.1+ and the double sided lighting demo available in the code sample pack in the gl-21/two-sided-lighthing/ folder. Just quick (5min) burn-in test with FurMark 1.19. At idle, the testbed draws around 50W. Under FurMark, the testbed draws 250W. With a PSU efficiency factor of 0.9 we get: (250-50) x 0.9 = 180W. We can remove 10W for the CPU and we get a rough approximation of 170W for the P5000. At idle, the GPU temperature of the P5000 is 33°C. The max temperature during the 5min stress test was 80°C. With a longer stress test, the max GPU temperature would have reached 81 or 82°C. In this test I only covered the graphics performances (OpenGL, OpenCL) of the Quadro P5000 compared to the GeForce GTX 1080. 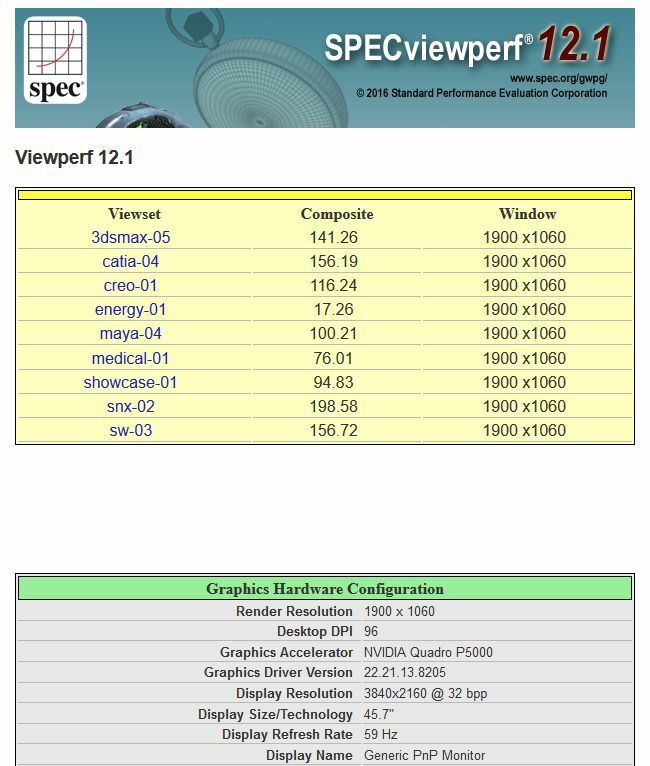 The GeForce vs Quadro performances is a question I often saw on the web. The goal of this article isn’t to tell you to pick up a GeForce in place of a Quadro, the goal is a simple GPU battle. If you need features such as Quadro Sync, Quadro MOSAIC or ECC memory, or if the CAD software you work with, requires a Quadro accelerator, you have to buy a Quadro. After this test here is what I can say: with normal and modern OpenGL or OpenCL applications, there is no real difference in performances between both graphics cards. Of course in applications that need huge amount of graphics memory (greater than 8GB), the P5000 will shine with its 16GB of GDDR5X memory, but for other modern OpenGL / Direct3D applications, there is no significant difference: for the same clock speeds, performances are more or less the same. Now for professional applications from ISVs (Independent Software Vendors) like Autodesk, Siemens or Dassault Systemes (Catia), the P5000 offers important gains compared to the GTX 1080. These gains essentially come from optimized graphics drivers (see the two-sided lighting test as an example of a particular optimization) and optimized firmwares. Thanks to the Internex team for the Quadro P5000 sample! The Quadro has seven more OpenGL extensions than the GeForce. Whats the extra mumbo-jumbo there? Nice. Can you test also the CUDA Performace? To get around this we can use shaders. Is there a way to use the GTX 1080 drivers on the Quadro P5000? Thanks! No. You think they’re stupid to let you do that? And also there are hardware and firmware differences. And there’s another reason they block you from doing that. Quadro are used for 10-bit content editing. Geforce is locked out and can only output 8-bit. Your score is messed up. You messed up with installing the drivers or settings because my Quadro P600 gets 107FPS in cinebench. It was a great test with very interesting results. 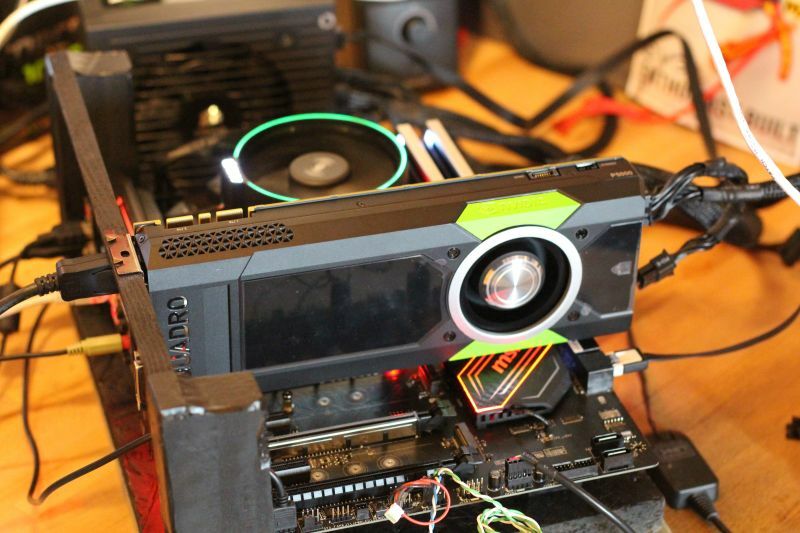 There are a lot of confusions and misunderstandings about Quadro graphic cards which this test was a light on those. One thing grabbed my attention in SPECviewperf test. 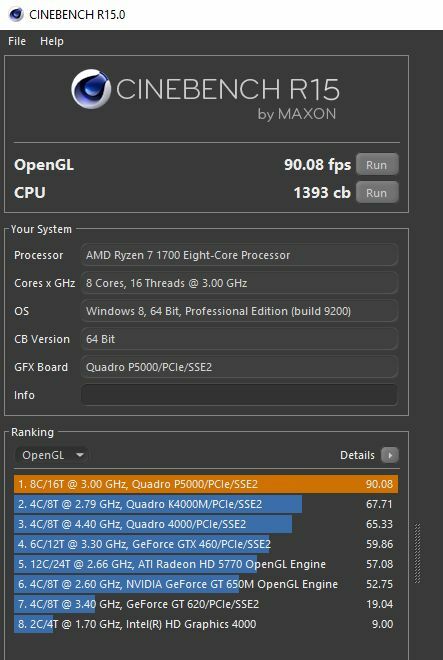 I noticed that all applications that using polygons (3ds Max, Maya and Showcase) are having almost the same results between P5000 and GTX 1080. 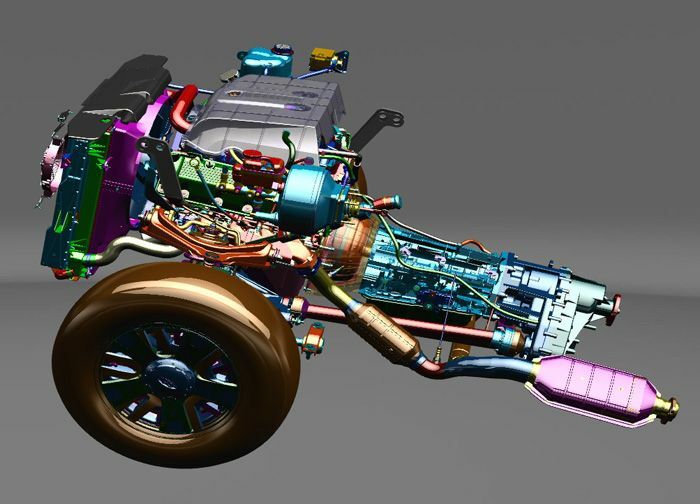 However, in the applications that using NURBS surfaces by default and having a “tessellation” process in the background (CATIA, SolidWorks, NX, Creo), P5000 performs a lot better than GTX. I’m using Autodesk Alias and SolidWorks and I experienced this lack of performance on GeForce cards before. 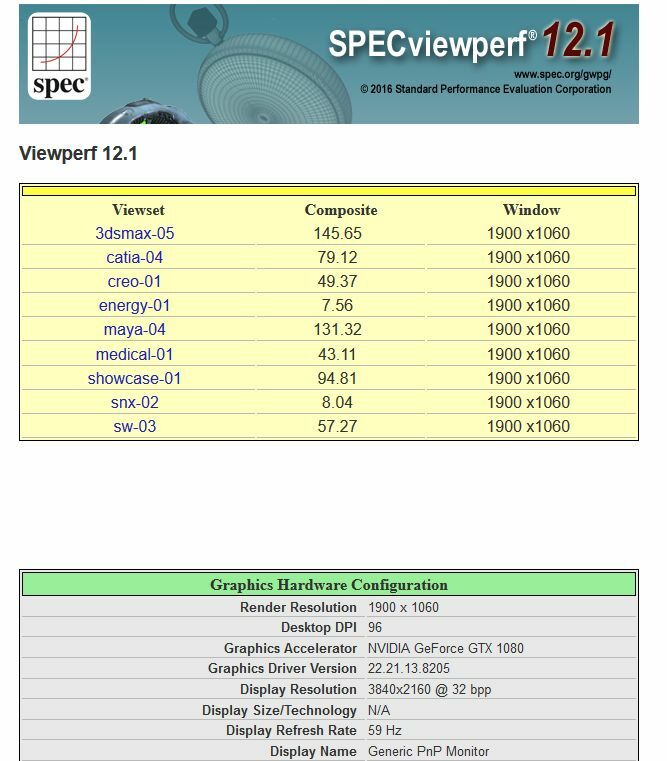 Also, SolidWorks has a feature called Realview which it doesn’t work on GeForce graphic cards. Thank you for this test. You did an awesome job. a lot of others things are intentionally *removed* from geforce vs quadro drivers. – famous error 42 when doing GPU passthrough in a virtual machine. only GRID and quadro card can be virtualized… so nice to have to pay 5x the price to enable virtualization! !